It is time to plan your home and kitchen needs as Paytm is offering 100% cashback under the name of 'Paytm Mega Home & Kitchen Sale'. 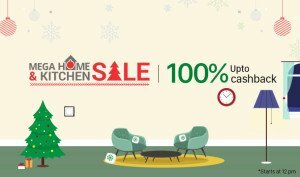 Paytm Mega Home & Kitchen Sale Date - December 18, 2015 - December 20, 2015. There will be 3 slots totally. One at 12 PM, one at 3 PM and another one at 6 PM. 100% cashback promo code will be in the Paytm page itself. 1. Visit Paytm Mega Home & Kitchen sale page here. 2. Browse through the offers. 3. Click on the offer you like. 4. Login if you are an existing user. Register if you are a new user. You can use the paytm cashback to mobile recharge, dth recharge, bill payments, bus ticket booking and shopping products from Paytm. Few other partner websites allow the customers to use paytm cash while making payment.